Harper just looks so big to me now that she can stand up! My parents called yesterday and said they were going to come to town because they had "some things to do" and thought they might drop by to see Harper. Yeah right.....I think their "things to do" were ....."let's go see Harper and pretend we have some other reason to come to town". ha! Harper is so spoiled by all her grandparents. This sweet little girl in my parents church passed on a few big toys to her and they brought them to her. She LOVED this horse! Just look how happy she is! This little car was pretty fun too! Thanks Abbi!!!!! (Abbi told her mom she thought she might like to pass on her time out chair to Baby Harper too but I think her mom decided she might need to keep it a little longer.) ha ha ha! We went and ate lunch at panera (our favorite) and then hit up Target and Starbucks. It was a fun treat! I have a new post up on my bank's blog - it's about planning for your child's college education. Have you thought about that yet???? Panera sounds amazing!!! I need to talk my parents and sister into moving here :) Cute little horse and toys! Sounds like a fantastic day!! Time with the Granparents are just the best! I love her little dress too! Panera is my favorite too!! We go at least once a week. :) I love Harper's green dress, it's precious. I am obsessed with the color green!! Panera, Starbucks, and Target sound like the BEST day to me. Those are all definitely at the top of my favorites list. Thanks for blogging, I just LOVE reading about your sweet family! Grandparents! They are just great! If H had been around for my wedding I would have let you carry her down the aisle in that cute green dress. After all she was my only junior bridesmaid even if she was still in your tummy! 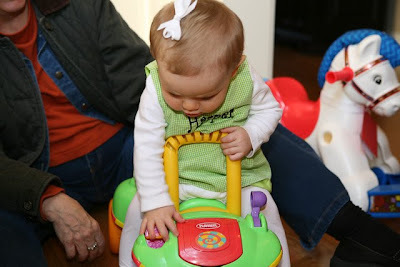 I'm pretty sure that little car is the same toy I have--which is also a walker. 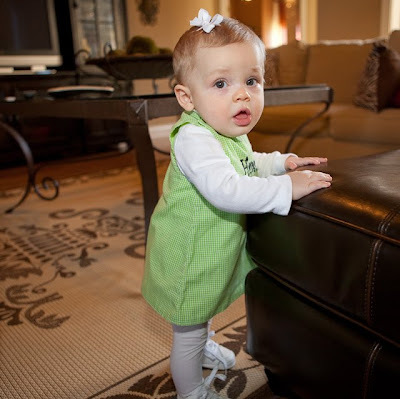 I bet Harper would love that if she can stand! My girl is crazy about it. Could your parents be any cuter?? I was thinking the same thing about how grown up my little girl is now that she is standing and starting to walk...I swear last night she was a baby and this morning she turned into a "big" girl! Harper is super adorable and I love following your blog. PS. you know that car turns into a walker right?! that is the same car that my daughter is using to practice her walking! I can't believe how big she is getting! And that dress? Precious!! The little car looks like the one we had. If it is, it will unfold into a walker. I think there is a little lever on the bottom. She is the cutest thing! The pictures with your parents are precious. That is so nice that your parents live close by. My parents and my husband's parents are out of the state. I wish that my mom and dad were around more often so that they can enjoy their grandkids. Now that is TOO darn funny about that little girl wanting to pass on her time out chair! our panera is right next to target, and we have a starbucks in target. it is the perfect place to go, and we do (at least once a week). harper is so cute! i need to get out some of my older boys toys that hadley would be interested in now. they grow up way too fast!!! Cutie! She is getting so big! We are firm believers that a child should earn his own college education. They will appreciate it a lot more. Your parents are so cute all color coordinated!! She is adorable! Love her dress!! She just keeps getting cuter and cuter! No wonder those grandparents can't stay away! In regards to college, I suggest you start now..my parents (not particularly wealthy) were wise & saved from the time my sister and I were born and I was able to go to a private Christian school w/out debt...I am so thankful for such a blessing. Also, thought you might want to pass this on to the single girls...its a focus on the family broadcast..check it out at http://www.focusonthefamily.com/popups/media_player.aspx?Tab=Shows&subcategory=FocusOnTheFamilyDaily. Harper does look big! Love the pictures of her on the horse! Too cute! Sounds like alot of fun!!! I was just talking about my Tootsie's college fund a few days ago and said we were a little behind and needed to start paying more attention to it...better sooner than later!!! Sounds like a perfect day to me, Panera, Target & Starbucks! Harper is a big girl now, time sure does fly by! Kelly! I have been reading your blog for about a year and one night i stayed up and read from the very beginning! Your story is so enlightening and Harper is the cutest little girl! You have the most precious family! Thanks for making me smile each day!! Oh your mom was just telling me last week in a comment on my blog how much she loves Panera. I was blogging about one of their soups that I got at BJ's and she said how much she loves eating at Panera. :) I hope y'all had a good time. Kelly, I don't like linking to my own blog but I know you have a lot of readers and perhaps you can also put it on your bank blog- active duty military who have at least 4 years left can sign their 9/11 GI Bill over to their children. It's a limited time, so it's something to certainly look into. how sweet of Abbi to do that!! Harper is getting so big and has the sweetest smile!! Harper is so adorable I can hardly stand it. She is just getting sweeter in every picture :). Also, your parents are so stinkin' cute! What a blessing to have them love on that sweet girl! I just bought that same car/walker for Cash. Did you know that it turns into a walker? Panera is mine and my girls favorite place to eat lunch. Sounds like you guys had a great time. I wish my parents lived close by and could come over for a visit now and then. Aren't grandparents great!!! Harper is getting so big...it happens and time flies. My daughter is turning 1 next week...Where has the time gone? Anyway, I really enjoy reading your blog, even on the not much going on days. Thanks! CUTE pictures for sure, she is getting so big! yay for starbucks, I went with a good friend and it was just a perfect fall day for a nice Skinny Cinnamon Dulce Latte! Hope you got something yummy! Hope these words bring you comfort! Praying! 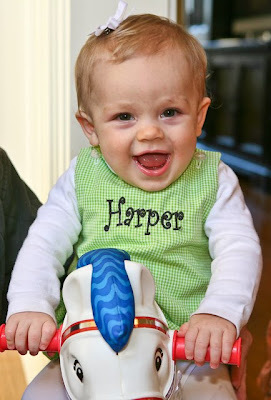 Love that pic of Harper on the horse--so precious! :) Love me some hand-me-down toys! FUN! Loving the green dress! What a fun outing you had. Panera, Starbucks AND Target. I am beyond jealous!! Looks like you had a great day!! I am so glad you brought up the 529 Plan. I used to work at a bank and they would tell us over and over again to save for college, but I didn't have a child yet so I thought I could wait....it is sneaking up so fast, I need to start!! Thanks for bringing it to my attention. Emma is not much older than Harper(about 7 months) so I really need to get on the ball!! Girl get ready to move that coffee table in the background! :) You will soon have a walker on your hands! Our Sam is 2 1/2 and we still can't have it in the house. It is like his face is attracted it to it. That is too funny about Abbi with her time out chair I used to feel the same way when I was small hahaha. Harper looks adorable with her new toys and she is getting so big!!! This is my first time commenting, and I love your blog. Thank you for the post on saving for college. We've been struggling with what to do in that situation, and your blog post really has given us some thoughts. Harper is just beautiful! Thank God for little girls (and boys). My little girl is 19 months old today, and short of my salvation, she is the best gift God has given me. Keep up the great blogging. Harper is just so darn cute! What a fun day! Harper is such a cutie standing up! She is just getting so big! 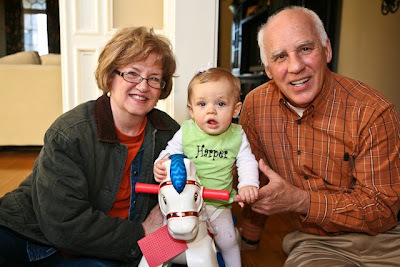 I wanted to let you know that my mom bought that same little rocking horse for her house for the grandkids. It scratched her wood floors bad! Just something to watch out for! Kelly, she is so cute! I can't believe she is old enough to be standing! Hope you are sleeping better! When we say our prayers at night we pray for good nights of sleep and we have been praying for you and Harper to get good nights of sleep, too! I know I always say this.....but Harper looks so precious. I think the white walking shoes make her look so "grown-up"! I remember the first time I put my girls in walkers, it seemed like time flew by right in front of my face. But even at 24 and 21, they're still so much fun and the loves of my life!! Grandparents + Target + Starbucks = Perfect day! I don't know about Panera because I've never been there! But yeah - I am sure that was a great day! Precious pictures! 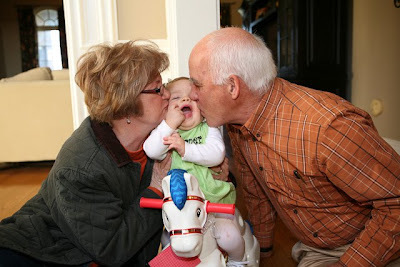 A beautiful little one with her grandparents & a horse, what more could she ask for? I have always LOVED picking out and getting toys for my kids. The best are hand me downs! What an adorable pumpkin outfit! Your daughter is always such a little fashionista! I commented once about how much I think Harper looks like your Dad...but I just had to say it again...She looks like your dad, ha! !